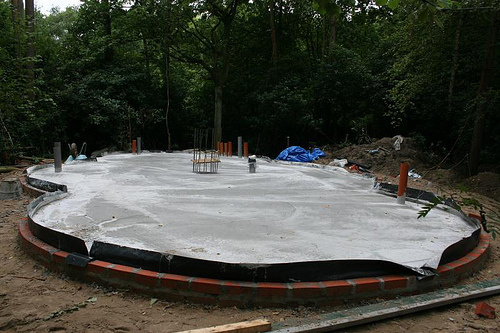 Due to local building regulations we were only allowed to have a concrete slab as a foundation. 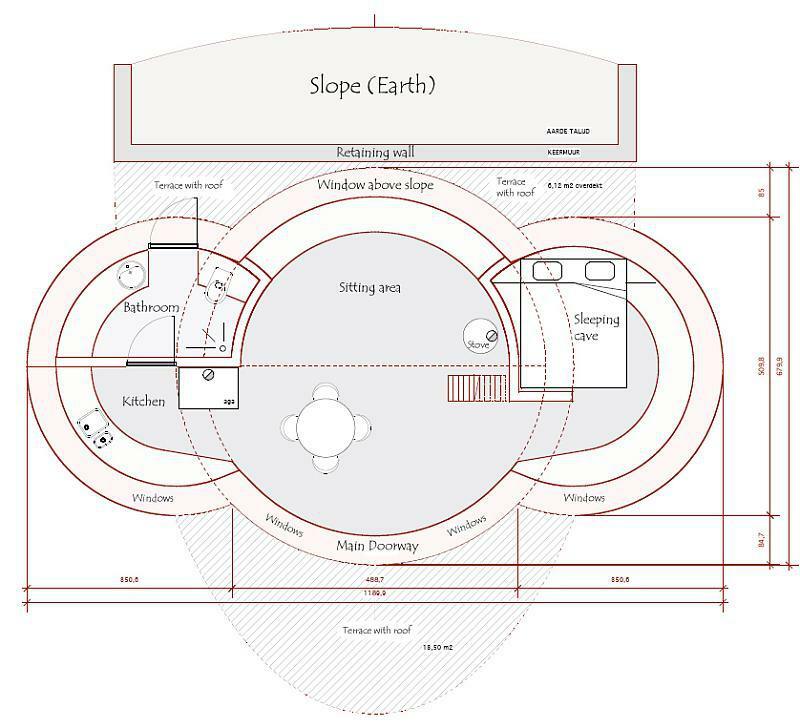 It´s supported by an underground concrete ring. All around the concrete pillar the skeleton was assembled. 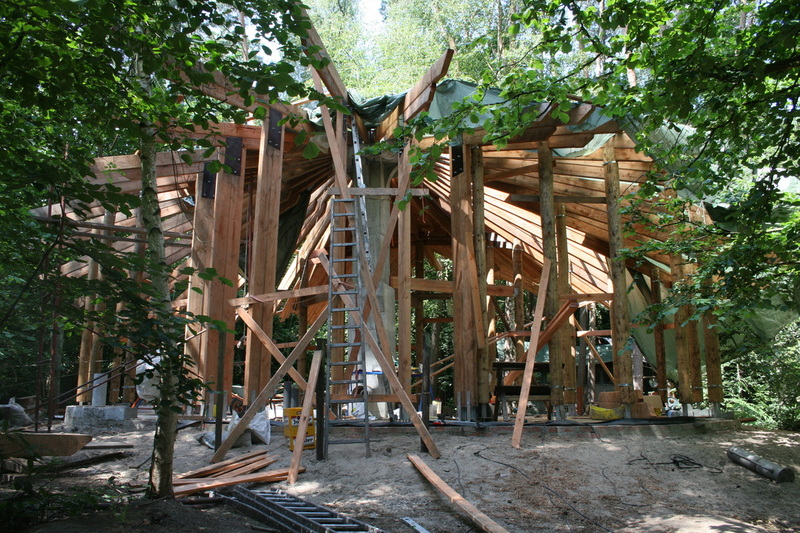 Big roofbeams were supported by pealed logs, gained from Belgian woods. Window and door boxes were attached to the skeleton. 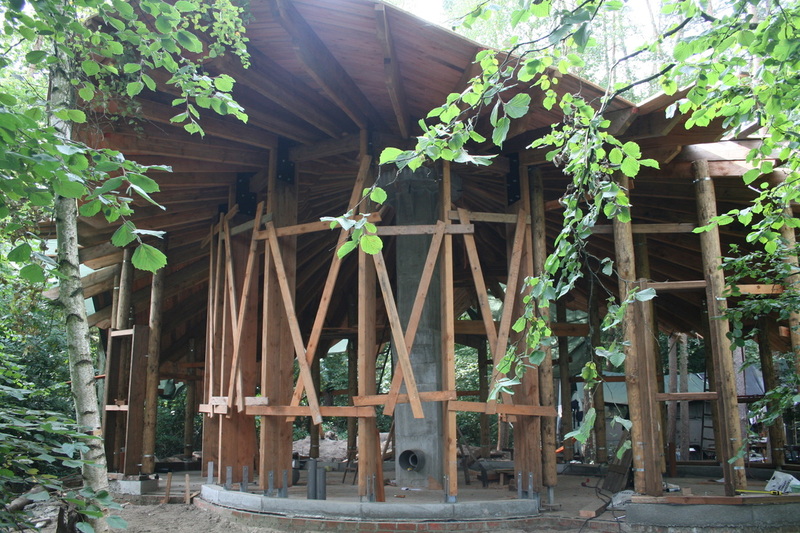 Notice how the whole skeleon is raised on a concrete toe-up, covered with a wooden ring beam. 1. 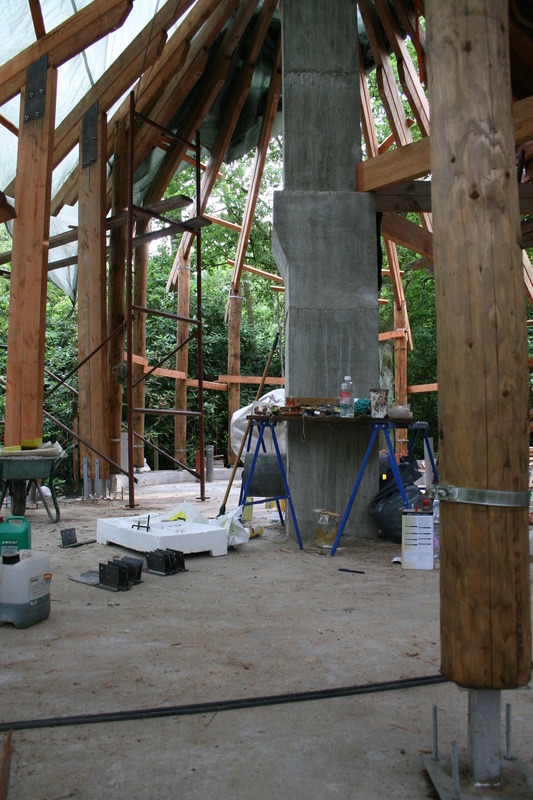 We first covered the roof beams with an organic shaped layer of planks. Together with a plastic foil, this would temporary protect our walls during construction from rain and snow. 2. After the walls were raised, we covered the first layer of planks with a second layer. By placing the top planks diagonally over the bottom planks. the whole structure became ridgid. 3. 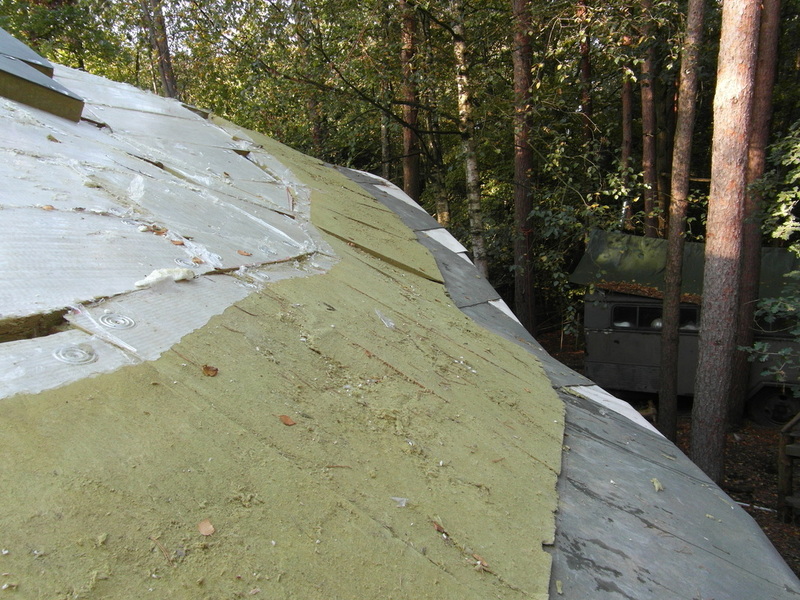 We covered the planks with a double layer of ridgid mineral whool insulation. We had to screw the insulation panels into the wood to prevent them from sliding down. Unfortunately, as tar paper is the only material that seals off screw holes, we had to use this none eco-friendly material to prevent moisture from seaping into the insulation material from underneath. 4. On top of the ridgid insulation we put a rubber lining that was covered with lava rocks and plants: our green roof! The skeleton was filled in with straw bales. Mind how the strawbales are placed vertically. This is more logic as the thickness and width of a bale is always the same, but the length differs for each bale. Placing bales vertically allowed us to keep a constant heart to heart distance between every vertical pole. 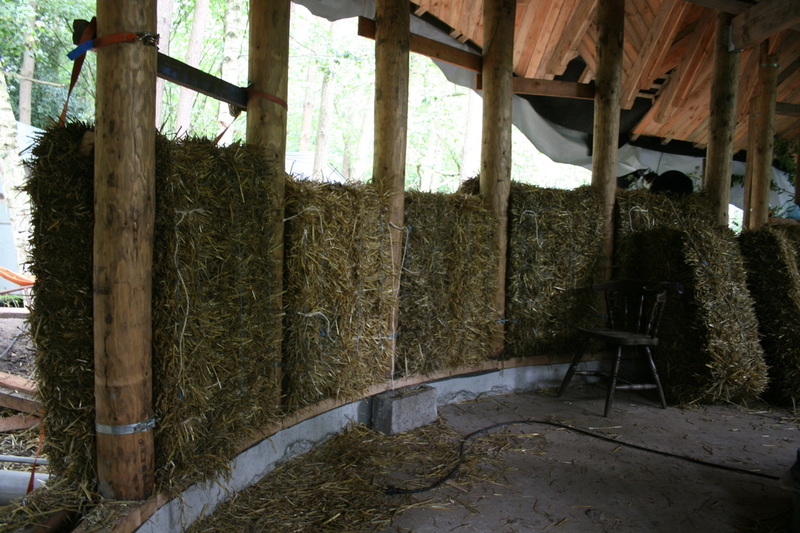 Also mind how we cut out the corner edge of each bale to fit snuggly around each pole. 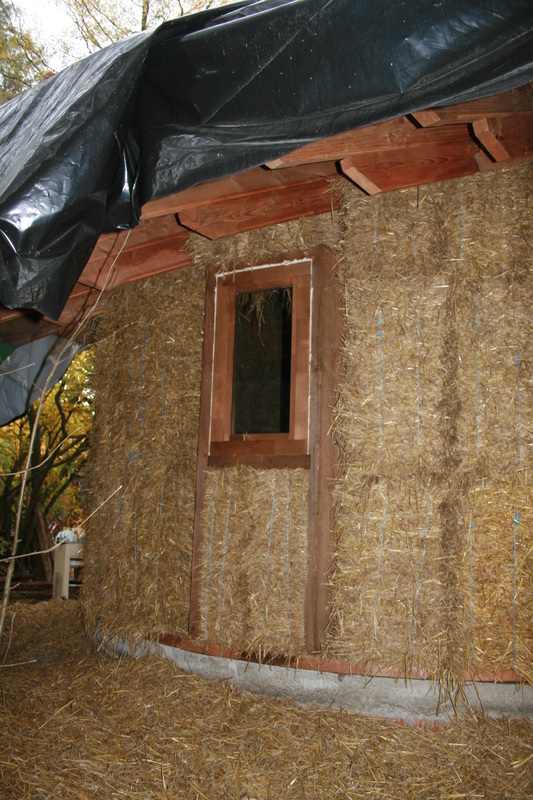 This way we were able to get a full layer of straw going all around the house, without any wood sticking through ('cold bridge') and still have the skeleton supporting the strawbales. Every gap was carefully filled with straw to prevent cold leaks. 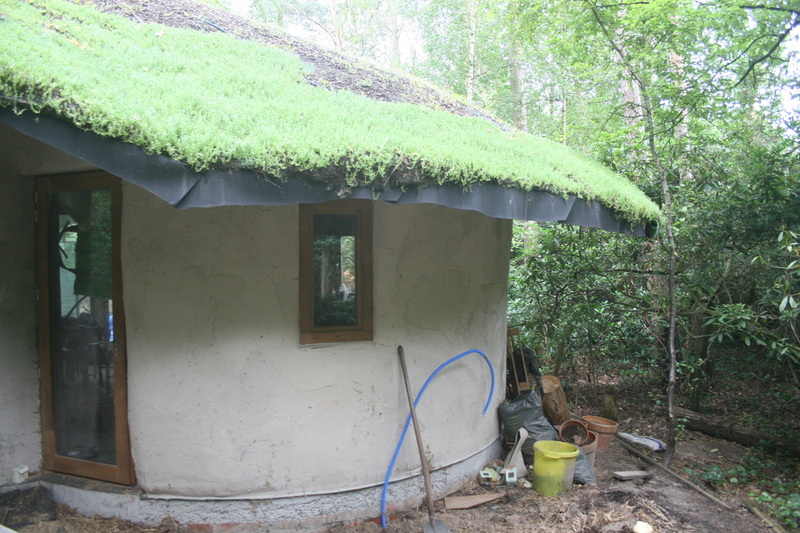 The outside was covered with lime by Mathias Lootvoet of Leemniscaat. 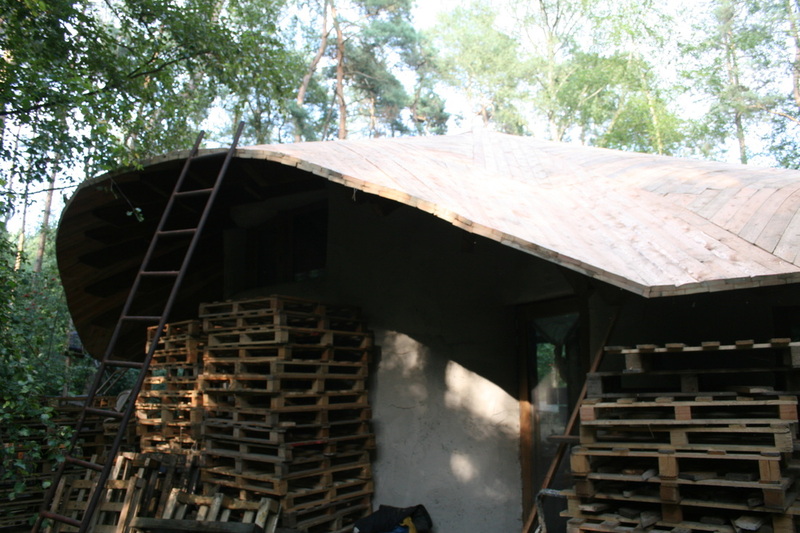 We decided to finish the outside render with loam because our roof overhang is so big that the walls are dry during the whole year and Lime was not necessary. 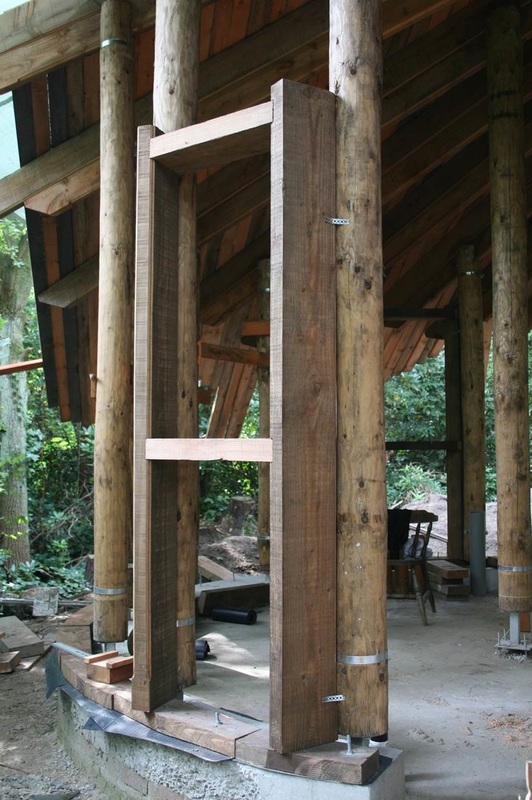 We used beams to support a wooden subfloor. 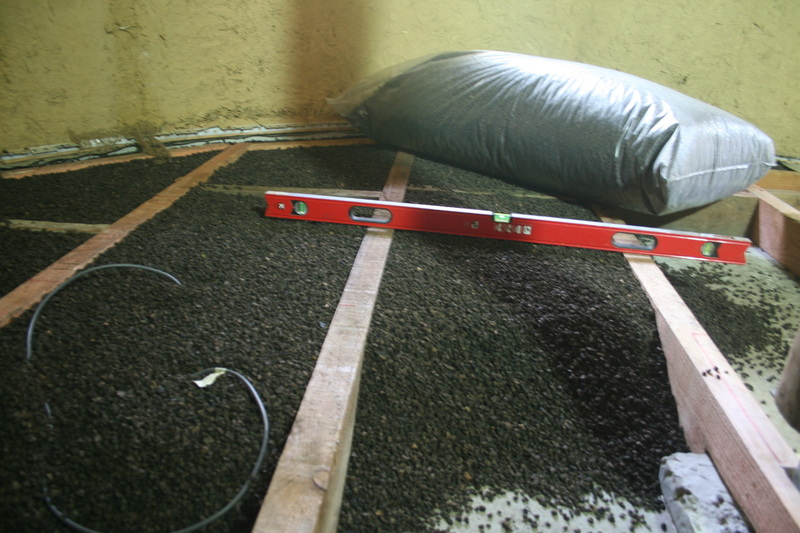 To insulate, we filled the the voids with roasted cork grains. 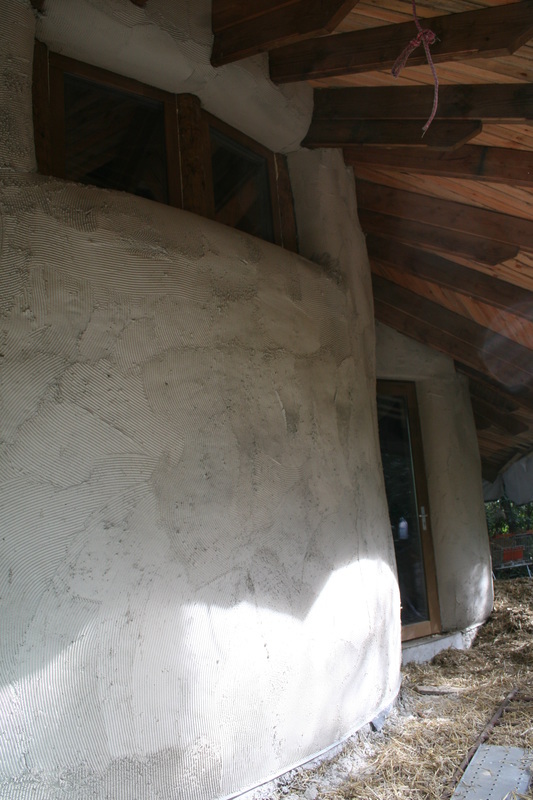 We used loam to render the strawbale walls on the inside. 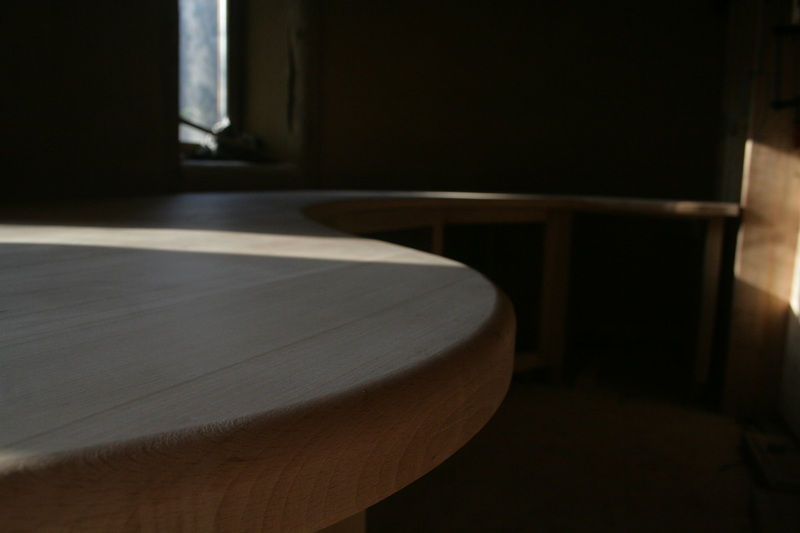 Also all furniture was built (and still is being built) single handed. 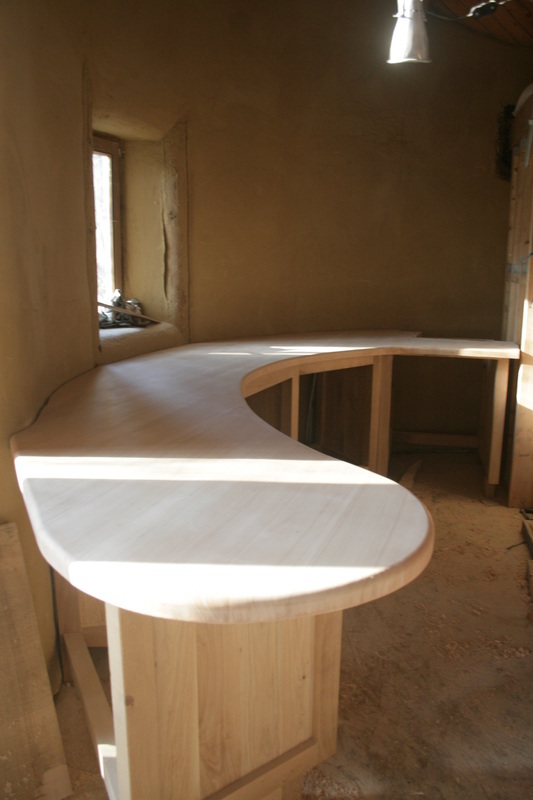 We always start from rough log planks.